Castor (alpha Geminorum) is a triple visual binary. Each component is also a spectroscopic binary. How many stars are part of Castor? Why can we learn about stars that are in binary systems that we cannot learn about stars that are not part of binary systems? 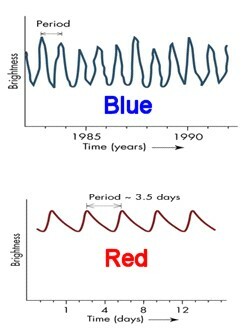 The light curve of a Cepheid variable star is shown here. What is the maximum apparent magnitude of the star? What is the minimum apparent magnitude of the star? What is the average apparent magnitude of the star? What is the period of the star? Include units. The period-luminosity relation for Cepheid variables is shown. What is the absolute magnitude of a Cepheid variable that has a period of 10 days? What is the absolute magnitude of a Cepheid variable that has a period of 3 days? What is the period of a Cepheid variable star that has an absolute magnitude of -4? Include units. The period-luminosity relation for Cepheid variables is also shown. What is the absolute magnitude of this star? Why are Cepheid variable stars important to astronomers? They can be used to determine distance. They allow astronomers to determine the time between supernova outbusts. Cepheid variables are the smallest of all stars. You cant fool me; Cepheid variable stars are not important to astronomers. What type of cluster is shown here? The light curves of two variable stars are shown here. Which one represents a Cepheid variable star? H-R diagrams of two different galactic clusters are shown here. How would these cluster appear visually different from one another? Cluster Top has curving stars; cluster Bottom has a straighter shape. Cluster Top doesnt have any blue stars in it; cluster Bottom does have blue stars in it. Galactic clusters all look the same in every way. The appearence of a cluster can not be determined from an HR diagram. How are Open Clusters with Galactic Clusters similar? They both have only old stars. The mass of the stars in them can be determined. They are in no way similar. How are Open Clusters and Globular Clusters different? Open Clusters usually have only older stars. Globular Clusters can have much younger stars. Globular Clusters usually have only older stars. Open Clusters can have much younger stars. Open Clusters usually have a lot more stars and are much larger than Globular Clusters. Globular Clusters usually have a lot more stars and are much larger than Open Clusters. Open Clusters are found in the galactic disk while Globular Clusters are found in th e halo of the glaxies. Globular Clusters are found in the galactic disk while Open Clusters are found in th e halo of the glaxies. number of Population II stars.